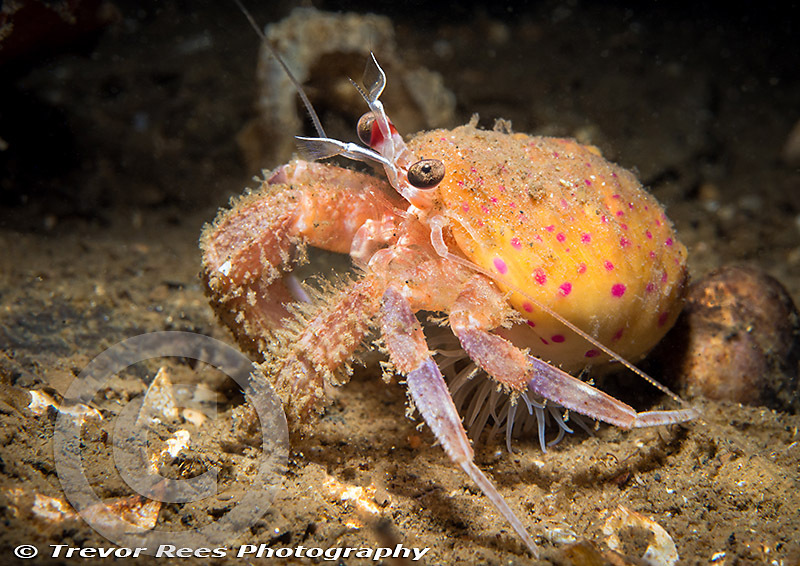 This hermit crab (Pagarus prideaux) is a host to the cloak anemone (Adamsia carciniopados). The anemone is tightly wrapped around the shell and the tentacles can be seen facing down underneath the crab so it is in a suitable position to pick up food scraps that arise from the crabs feeding activity. it is an unusual anemone in that it is never found without a crab and it tends to stay with the same crab for life. The symbiotic relationship is an intimate one. The anemone secretes a hard extension to the crabs shell and this means that as the crab grows its shell also gets bigger. The crab benefits by getting an easier life in not having to move home and the anemone gains by not being abandoned.